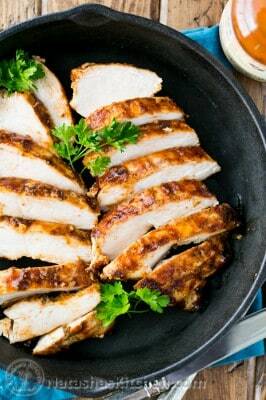 This is my sister's famous juicy BBQ chicken breast recipe. The marinade is so simple with just 3 ingredients. You know what's awesome? You can do all of the prep in advance so all you have to do is toss it on the grill before you party starts! In a casserole dish (no need to get extra dishes dirty), combine 1/2 cup mayo, 1/2 cup ranch and press in 6-8 garlic cloves. Add chicken and turn it several times to coat generously in the marinade. Season each individual side of the marinated chicken breasts with Johnny's seasoning. Cover the casserole dish with plastic wrap and refrigerate overnight to marinate. Marinate 10 hours or up to 24 hours. Preheat your grill to 400˚F. Brush the grates with oil. Place chicken on the grill then reduce heat to medium-low, cover and cook approximately 10 minutes per side (rotating the chicken 90˚ after 5 minutes to create criss-cross grill marks). When you turn your chicken over, generously brush the grilled side of the chicken with BBQ sauce. Repeat grilling your second side, rotating 90˚ after 5 minutes. Brush the second grilled side generously with BBQ sauce. Remove from grill, place on a platter and immediately cover with foil. Let chicken rest under foil for 15 minutes before cutting into it. Serve with more BBQ sauce, these mashed potatoes and this salad (or this salad), and you'll want this to drink. Notes: When done, chicken breast should have an internal temp of 165˚ and should be firm but still soft. Juices will run clear when you cut into it. Our chicken breasts were pretty large and took about 25 minutes total on the grill. Don't overcook them or they will turn rubbery and keep in mind they will continue cooking even off the grill.